We're enjoying a lazy weekend in my household. No plans, no real reason to clean (wink), and snowy weather outside. Because of this, I thought I'd give you a quick rundown of one of my layouts. This is for anyone who is curious why I choose a design, how I create the elements or are interested in tips for tying it all together. Because I'm discussing my daughter's love of reading, I split the title in three pieces, drawing the viewer's eye down over the photo of Gracie reading. Once the eye scrolls down the photo, I want to continue to take your eye across the layout, to see the journaling and details. I used an image from a classic book to draw the eye across the layout and off the page, visually creating a period with a large, jeweled button. You may also notice that I've created a visual triangle, clumping my elements in three locations. Keeping elements in odd numbers is more pleasing to the eye. I created two small books to house the most important part of the title, 'READ.' To make these books, I cut six, 1x2" pieces of cardstock, stamped a script background on them, folded a crease into the middle and sewed a seam for a spine. I curled the pages to create texture and inked the edges to keep them looking shabby chic to go along with the photos and papers. I then added the letters, which I printed in a bold font that reminds me of learning your letters. 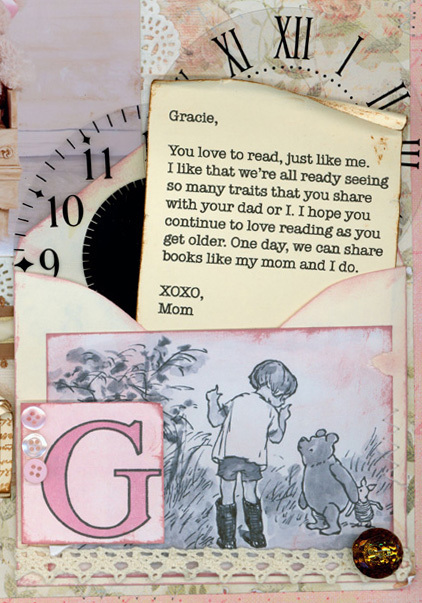 Because I wanted to include a letter to my daughter, some images and clocks to signify the passing of time, I created an envelope to tuck them all into, keeping the layout uncluttered and the focus on the photo. 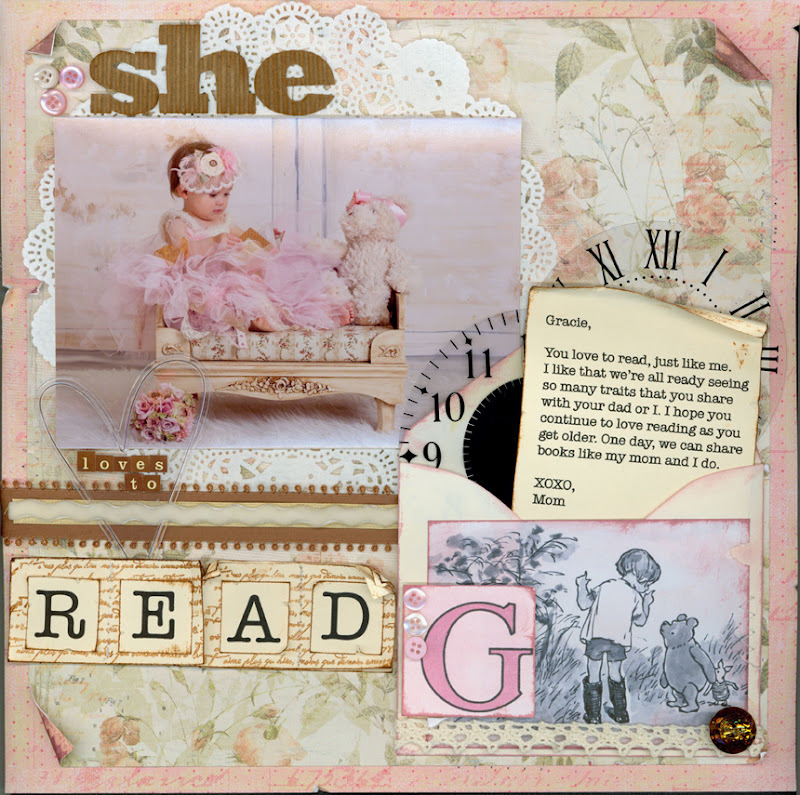 I simply layered all of my items, added a bit of ribbon, some buttons, and inked and distressed all of the elements. If you're going to use a distinct style, like shabby chic, make sure all of the elements coordinate. 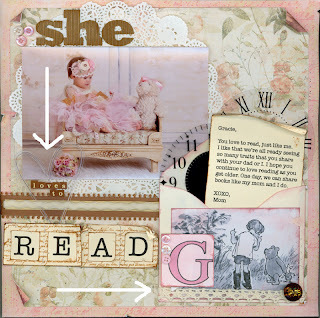 Distress edges, ink everything lightly, use antique lace, buttons, paper doilies, ephemera, and muted colours. Once you finish a layout, if it doesn't make you over the moon happy, leave it out for a few days. Each time you pass by, you'll see it from different angles, and in different lights, which will help you pinpoint something that's missing, or just give you a chance to look again with fresh eyes. I often find exactly what was missing when I do this. Supplies: The patterned paper I used is by Prima, the large button is Bazzill, the large alpha is Jillibean Soup, the smaller is Cosmo Cricket, the ribbon is American Crafts and Die Cuts with a View, the transparencies are Maya Road, the cardstock is Bazzill, all ink is Ranger Distress Ink, and the stamp is Shabby Green Door. 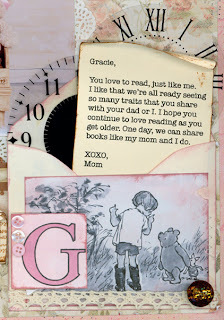 The buttons and doily are found objects and the Winnie The Pooh image as well as the G monogram are reprinted digital images.